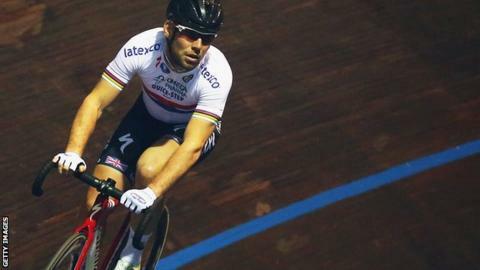 Mark Cavendish will compete on the track at November's Gent Six Day event in an attempt to recover full fitness after dislocating his shoulder in July. Cavendish, who won world Madison gold in 2005 and 2008, will race with Omega Pharma-QuickStep team-mate Iljo Keisse. The 29-year-old Manxman last raced at the event in 2007, although team boss Patrick Lefevre blocked his attempt to take part last year. Cavendish made his comeback from injury at August's Tour de l'Ain. He damaged his shoulder in a fall during the sprint finish on stage one of the Tour de France in July. Since then he has also competed in the Tour de Poitou-Charentes and the Tour of Britain, where he was narrowly beaten in a sprint finish on the final stage. Lefevre prevented Cavendish's involvement in the 2013 Ghent Six Day as he was worried about his star sprinter picking up an injury that might keep him out of action on the road. After winning madison gold in 2008, Cavendish and Sir Bradley Wiggins went into that year's Olympics as favourites but finished eighth in Beijing.